Now that you've moved into your first home, you probably have a list a mile long of improvements you'd like to make to the current structure. As one of the most frequently-used spaces in your home, your bathroom should take precedence. One of the growing trends in bathroom design is taking inspiration from a spa, and using a whirlpool bathtub is the best way to do so. 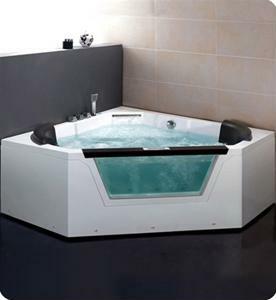 A whirlpool bathtub can act as the focal point of your washroom and will instantly give the space a luxurious touch. There are countless designs out ther to choose from that offer hydromassage therapy functions, PVC piping system to protect from bacteria buildup and still serve as a standard bathtub for everyday use. If you have the space to spare, adding a walk-in shower can greatly improve the utility of your bathroom. By placing the whirlpool tub and shower in their own respective corners, you can leave added space in the rest of the room for a bathroom vanity, toilet, and other bathroom accessories. Why spend money going to a spa in your town when you can create one at home? These dynamic designs can make your dream bathroom a reality. What renovations do you suggest for those looking to create a spa-inspired bathroom?